It is well known that the Basque had a very prominent presence and role on the first trip round the world. On that first expedition, Juan Sebastián Elkano played an essential role and became the first sailor to achieve such a feat. 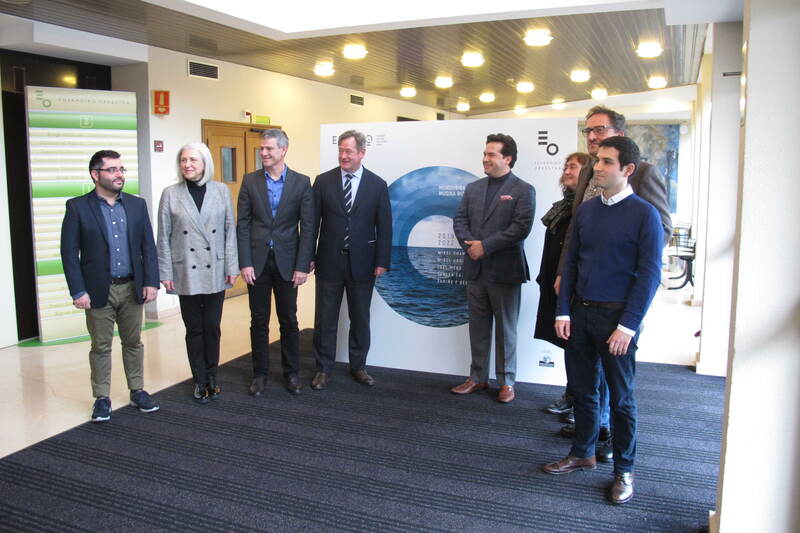 The 500th anniversary of that expedition is being commemorated from the beginning of this year, 2019, until 2022, and it is within this context that the Basque National Orchestra, constantly aiming to be a cultural beacon in the region, has decided that it should contribute to the study, research, and exploration of the figure of Elkano from a musical standpoint. Throughout this process, the work carried out for months by the titular conductor, Robert Treviño, has been very important, as he has continued to delve deeper into contemporary Basque musical creation. Additionally, Treviño has immersed himself, in his own way, into Eresbil (The Basque National Music Archives) and has shared his artistic vision in order to help our version of Elkano—and his circumnavigation—to take shape and materialise musically. 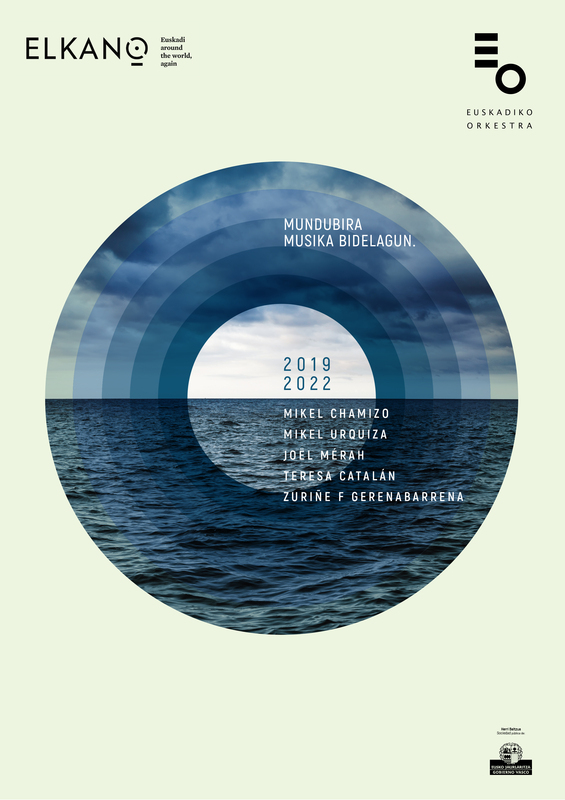 As a result of this entire process of reflection and engagement with our history, the Basque National Orchestra has embarked upon a new musical adventure and, in memory of the journey undertaken by the sailor from Getaria, the Orchestra has asked five Basque composers to create as many compositions with the only rule that they must focus on different sections of the journey. The joining of all of these compositions will complete our trip round the world from a completely innovative musical perspective. The Basque National Orchestra will debut the five commissioned pieces throughout the 2019/2020, 2020/2021, and 2021/2022 Seasons. Each of them will be presented in a different programme; at the end, they will be recorded and released together on a CD. The entire journey that is this project and its results will become the legacy and the great contribution of the Basque National Orchestra to the discovery of Elkano himself and his first trip round the world. This will be the Orchestra's way of joining the Mundubira 500 Foundation: Elkano Fundazioa was created with the aim of coordinating projects that promote knowledge about Elkano and to continue researching a part of history that is still unknown in many ways. The Orchestra's new musical undertaking follows in the footsteps of the TESELA Project, carried out to mark the 30th anniversary of the Orchestra. At that time, eight works were commissioned to as many composers of different nationalities and international prestige: the “teselas,” or tiles, that would make up a mosaic of contemporary music with a single common theme—Basque culture. It was a look in the opposite direction of our current project; back then, the international composers looked towards the Basque Country and now, with this look from the Basque Country towards Elkano, these new pieces help us to travel—through music—back in time to that first trip round the world. Both cases serve as a vindication of the fact that the Basque National Orchestra is a promoter of creation, and they both likewise leave behind a musical legacy of great cultural importance. Below are the initial ideas and reflections that have been provided to us by the five composers who will act as the protagonists of this musical journey round the world, as well as their biographies. The first to set Elkano's journey to music will be Mikel Chamizo, who has been asked to include choral voices into his score, with singing by the Bilbao Choral Society. Chamizo will be responsible for the “Start of the Expedition, 1519” and his work will make its debut at the start of the 2019/2020 Season, next autumn. «Navigare necesse est, vivere non necesse (“We have to sail, we do not have to live”) is a phrase that is in Parallel Lives by Plutarch and is attributed to Pompey, who used it to rally his sailors to convince them when they didn't want to set sail for fear of a storm that would probably end up killing them. But it is also a phrase that documents two realities: the strategic importance of sailing from the very beginning of human society, and the terrible personal risk that those involved in such an activity assumed. The expedition by Magellan and Elkano round the world, which Stefan Zweig called the “Second Odyssey,” is a paradigmatic example of a way of approaching life that can no longer exist. The search for an alternate route between America and Asia, penetrating an area of the world that had not been mapped in order to accomplish said search, was something driven by the Magellan's faith that, very probably, would end in fatality. How did Elkano and his men prepare for such an exploit? What mental outlook did they have towards facing their fear of the unknown? Mikel Chamizo studied composition at Musikene under Ramon Lazkano, Gabriel Erkoreka, and Stefano Scarani. His music has been played in countries like France, Switzerland, Italy, Poland, Sweden, and Chile, as well as at festivals and in music cycles like La Biennale di Venezia, the San Sebastián Musical Fortnight, and Musikaste. Among his more recent projects are Bertso berriyak jartzera nua, a musical exploration of bertsolarism alongside Maialen Lujanbio which made its debut during the Miramon Matinées Music Cycle of the Basque National Orchestra; Espirals, written for the Cadaqués Orchestra Ensemble; as well as his participation in the contemporary music teaching project entitled Soinua iratzarri, which was selected by San Sebastián 2016 as one of the most noteworthy initiatives in its European Capital of Culture project. Mikel Urquiza will pick up Chamizo's baton, focusing on “South America” in the spring of 2020 with his piece's debut. «The Basque National Orchestra has asked me to participate in this ambitious project that aims to illustrate the journey made by Elkano round the world. More specifically, they've asked me to focus on the South American part of the expedition which, still under the leadership of Magellan, made a stopover in what is today Brazil and Argentina. Elkano's journey round South America immediately awakens in my mind's eye the memory of later migrations: those that have been made in a similar fashion, forming part of a global “Basque Diaspora” movement, and the more recent ones, in the other direction, that have been made by many South Americans who live among us today. Urquiza studied composition under Gabriel Erkoreka and Ramon Lazkano, and subsequently continued his studies in Paris. There, he composed with and worked for numerous French musicians and groups, such as pianist Wilhem Latchoumia, Quatuor Diotima, l'Instant Donné, and Ensemble InterContemporain. Likewise, he worked in Germany with soprano Sarah Maria Sun, Ensemble Mosaik, Ensemble Ascolta, and Trio Catch in festivals such as ECLAT and during the Philharmonic of Cologne's season. He works with the most important Basque music institutions, such as the Basque National Orchestra, the BBVA Foundation, the San Sebastián Musical Fortnight, and Musikagileak. Joël Mérah, a composer from the French Basque Country, will guide us through the water of the “Pacific and Asia.” This will be in the autumn of 2020 and will include soprano singing. «The piece has two possible titles: …un certain parfum de sagesse II or …Jakinduriaren usaina. In two movements: 1/ Han - Hor - eta - Hemen; 2/ Zure inguruan. The orchestra piece that I want to compose for the project to commemorate the 500th anniversary of the trip round the world by Juan Sebastián Elkano, commissioned by the Basque National Orchestra, will be guided by a feeling of peace brought on by large open spaces and travelling. That idea of peace makes reference to the feeling that flooded the spirit of Elkano and the men who accompanied him on their odyssey in the Pacific; an ocean that owes its name to Magellan, who referred to it as “Pacific” due to the favourable weather conditions they experienced during their voyage. Above all, I aim to evoke an inner world (the one of Juan Sebastián Elkano, probably) rather than an outer, epic one. Mérah started his studies in Bayonne and continued them in Paris. He works with numerous ensembles and orchestras in Paris, Bordeaux, Bayonne, Irun, and Tokyo, and he cultivates all musical genres (chamber music, solo, orchestral music, opera, ballet, film, etc.). He has received several awards for his composition, noteworthy amongst which is first place in the Toru Takemitsu Composition Competition of Tokyo. He is a member of l'Ensemble 0 and teacher at the Maurice Ravel Conservatory of Bayonne. Teresa Catalán is the senior member of this group of Elkano composers. She will help to start the journey home through “India and Africa” in the spring of 2021. Catalán has received several awards for her performances, composition, and in recognition of her musical career, such as the 2017 National Music Award (composition). She is a member elect of JAKIUNDE, the Government of Navarre's Council of Culture, and Emeritus Professor of Composition and Instrumentation at the Royal Conservatory of Music of Madrid. Her compositions have been performed at the most important festivals and in different countries. She has been commissioned by numerous performers and institutions—both national and international in scope—and regularly teaches courses and gives lectures at music festivals and in institutions, universities, and conservatories in different countries. The composer from Álava, Zuriñe F. Gerenabarrena, will round off the three-year journey with the “Return, 1522.” Her debut, as well as the close of this voyage, will come in the spring of 2022. The composition will last for around 8 to 10 minutes. Within the overall idea of creating a glimpse into the Basque sailor's journey round the world (including the start, the different obstacles and places where the expedition went, and the return journey), and doing so by means of each piece individually and collectively, as if the compositions were tiles in a mosaic, the section that I will tackle will be the final stage, the return. The Magellan-Elkano Circumnavigation, which expanded on the notion of the world that was held at the time (just like space travel, advances in science and technology, and natural phenomena), casts doubt on our certainties and forces us to rethink ideas that we once believed were set in stone. These are things that broaden our mind and help us to reinvent ourselves and expand our imagination. This piece is meant to be a metaphor for travel in terms of resisting and moving forward through adversity with energy to reach the destination. While writing the piece, I intend to get my start based on prior experience gleaned with electroacoustic works, as I wish to combine elements of sound that come from the electronic school of thought in terms of instrumentation. It is not my intention to make a programmatic or descriptive piece, but I do have a certain desire to work on exploration from the perspective of sounds linked to darkness and difficulties, alternating with brighter textures through a predominant use of percussion and metal—sometimes as a whole, and other times as a way to add colour. Gerenabarrena studied under Carmelo Bernaola and Franco Donatoni in Milan. A versatile composer, she has pieces ranging from commissioned works for soloists, symphony orchestra pieces, pieces for theatre, dance, film, electroacoustic music, and multidisciplinary projects. She is present as a composer and creator in several international forums in Europe and America. Her music has been performed by various orchestras, ensembles, and instrumentalists, and she is commissioned by and receives aid from Basque and European institutions, as well as Japan. She also undertakes work at Musikene.